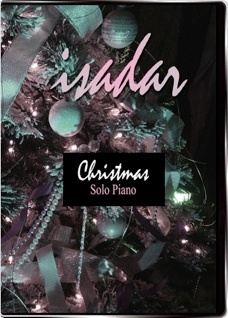 Isadar: Solo Piano, Volume 3 is the third in a series of four (so far) DVDs that feature Isadar’s live performances of selections from his six (so far) solo piano CDs and some of his music videos. Volume 3 stands out in that some of the music is jazzier than the previous DVDs, there are three pieces that have not yet been released on recordings, and there is a short interview with Isadar at the end of the disc. I love the three new pieces: “Broken Valentine” and “The Man Who Broke My Heart” are originals to be released on an upcoming solo piano CD called Red, and his arrangement of Liz Story’s “Things With Wings.” They clearly indicate some changes in Isadar’s style, incorporating more jazz as well as his always impressive playing chops and expression of deep emotion. The music video on this disc is “Snow,” from Isadar’s 2003 release, The Purple Heart, an improvisational recording that honors those who lost their lives in the 9/11/01 tragedy. 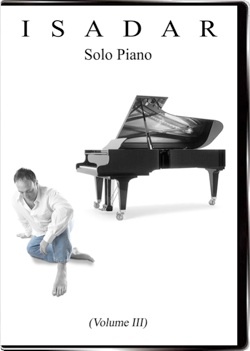 As on Volumes 1 and 2, the performances are filmed from several different angles, allowing the viewer to really see what Isadar is doing as well as hearing it. The overlapping video montages are especially helpful and interesting, and I think fellow pianists will really enjoy those and find them useful in learning Isadar’s sheet music. All four of Isadar’s DVDs (so far) have been great to watch and listen to, but Volume 3 is my favorite. Check it out!